Scientists can never say that something is 100% certain, but they can come pretty close. After a while, a theory becomes so strong that the academic community accepts it and moves on to more interesting problems. Replicating an experiment for the thousandth time just isn’t a good use of scientific resources. For example, conducting a medical trial to confirm that smoking increases one’s risk of cancer is no longer very useful; we covered that decades ago. Instead, a medical trial to test the effectiveness of different strategies to help people quit smoking will lead to much greater scientific and societal benefit. In the same manner, scientists have known since the 1970s that human emissions of greenhouse gases are exerting a warming force on the climate. More recently, the warming started to show up, in certain patterns that confirm it is caused by our activities. These facts are no longer controversial in the scientific community (the opinion pages of newspapers are another story, though). While they will always have a tiny bit of uncertainty, it’s time to move on to more interesting problems. So where are the real uncertainties? What are the new frontiers of climate science? First of all, projections of climate change depend on what the world decides to do about climate change – a metric that is more uncertain than any of the physics underlying our understanding of the problem. If we collectively step up and reduce our emissions, both quickly and significantly, the world won’t warm too much. If we ignore the problem and do nothing, it will warm a great deal. At this point, our actions could go either way. This curve shows us that climate sensitivity is most likely around 3 degrees Celsius for every doubling of atmospheric carbon dixoide, since that’s where the area peaks. There’s a small chance that it’s less than that, so the world might warm a little less. But there’s a greater chance that climate sensitivity is greater than 3 degrees so the world will warm more. So this graph tells us something kind of scary: if we’re wrong about climate sensitivity being about 3 degrees, we’re probably wrong in the direction we don’t want – that is, the problem being worse than we expect. This metric has a lot to do with positive feedbacks (“vicious cycles” of warming) in the climate system. Another area of uncertainty is precipitation. 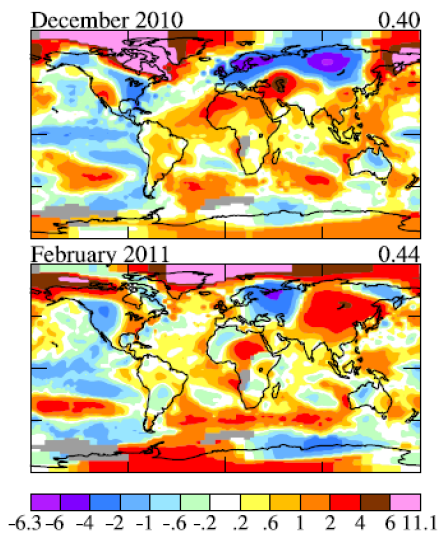 Temperature is a lot easier to forecast than precipitation, both regionally and globally. With global warming, the extra thermal energy in the climate system will lead to more water in the air, so there will be more precipitation overall – but the extra energy also drives evaporation of surface water to increase. Some areas will experience flooding, and some will experience drought; many areas will experience some of each, depending on the time of year. In summary, we will have more of each extreme when it comes to precipitation, but the when and where is highly uncertain. Glaciers and ice sheets melt and fall into the ocean, which is very difficult to model. If we cause the Earth to warm indefinitely, all the ice in the world will turn into water, but we won’t get that far (hopefully). So how much ice will melt, and how fast will it go? This depends on feedbacks in the climate system, glacial dynamics, and many other phenomena that are quantitatively poorly understood. These examples of uncertainty in climate science, just a few of many, don’t give us an excuse to do nothing about the problem. As Brian, a Master’s student from Canada, wrote, “You don’t have to have the seventh decimal place filled in to see that the number isn’t looking good.”. We know that there is a problem, and it might be somewhat better or somewhat worse than scientists are currently predicting, but it won’t go away. As we noted above, in many cases it’s more likely to be worse than it is to be better. Even a shallow understanding of the implications of “worse” should be enough for anyone to see the necessity of action.